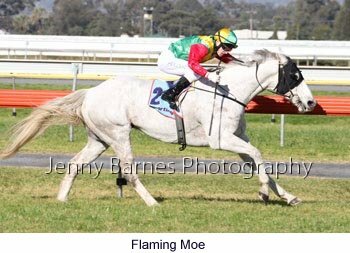 Another nice winters day for racing with families again enjoying being out of the grandstand lawns in the sun. 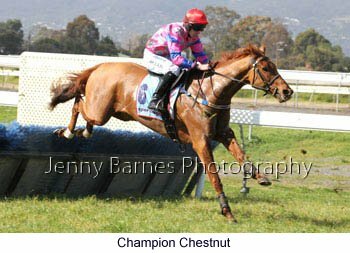 The first race the Hurdle was part of the Over The Rainbow series. 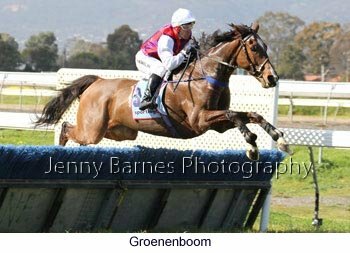 Groenenboom went straight to the front and went well clear from End of Time then Goldtown followed by Rampur, Trenchtown and Honour the Force. 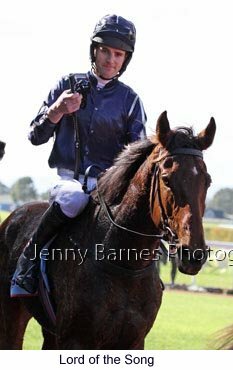 In the straight the first time Groenenboom was well clear from Trenchtown and End of Time followed by Goldtown inside Honour the Force with Lord of the Song well back in the field of 11 on the rails. Along the back Groenenboom continued to be well in front from End of Time and Trenchtown then Honour the Force from Bankabul and Rampur. 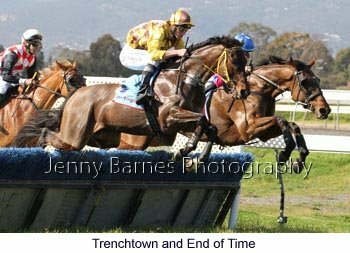 By the 800m Trenchtown and Honour the Force charged up to hit the lead together from Groenenboom with End of time next as Lord of the Song and Viva Delspec started their runs. Around the home turn Honour the Force was in control from Trenchtown but Lord of the Song was starting to look ominous as he ran on strongly around the outside. 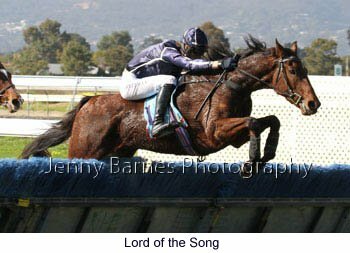 Over the second last Honour the Force held a narrow lead but soon Lord of the Song swept to the front with Viva Delspec still making ground down the outside with Trenchtown in the centre and End of Time making his run closer to the rail. 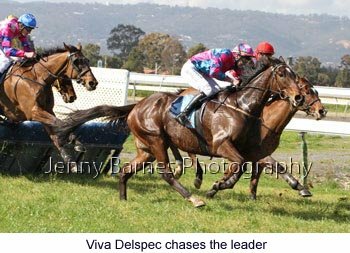 Coming to the last Viva Delspec tried to make a last challenge to Lord of the Song but the favourite had too much speed on the flat racing away to win and take his jumps record to 9 starts for 4 wins including his last three at Morphettville and 4 seconds. 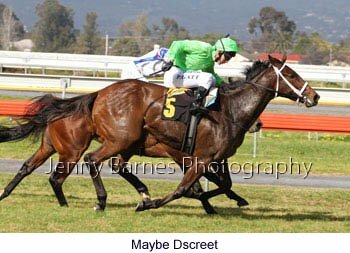 Viva Delspec having only his 4th jumps start was gallant in defeat taking his record to 1 win and 2 seconds while End of Time finished resolutely for third from Honour the Force. 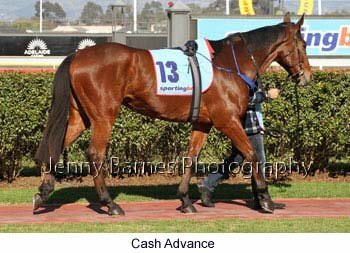 Race 2 was for the 2yos and all the buzz pre race centred around the filly Maybe Discreet first up from a spell. 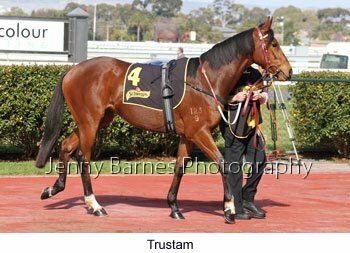 At her first start she had run a game second to stablemate Fire Thunderbolt who later won in Melbourne and only just missed out on a Blue Diamond run. 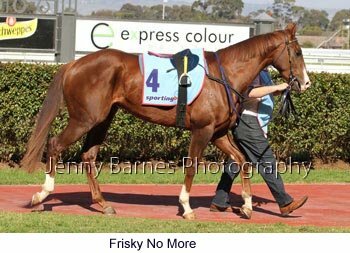 Showing a little of the attitude the 'Discreet' fillies are known for in the mounting yard Maybe Discreet looked ready to race. 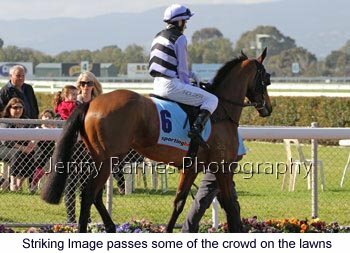 On settling Little Critter pushed through near the rail to lead Maybe Discreet and once Supreme Ruler dropped back it was a race between the two. In the straight the classy Little Critter kicked clear and looked like he may have the measure of Maybe Discreet but inside the final 50m the leader began to tire and Maybe Discreet lifted in the final few bounds to grab victory on the line from Little Critter with Trustam running on for third ahead of Butterfly Queen. 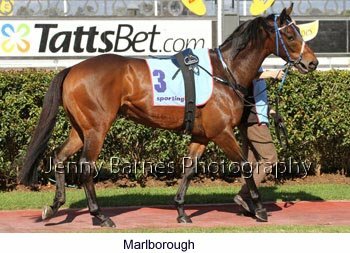 The 3yos lined up next with a promising group assembled including a well known name in Marlborough. 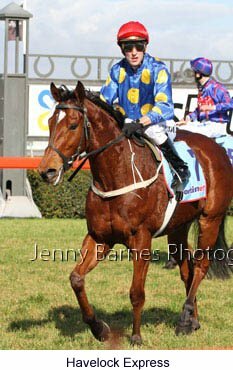 The previous Marlborough after starting his career as a 2yo was successful on the flat until starting his jumps career as a 6yo. 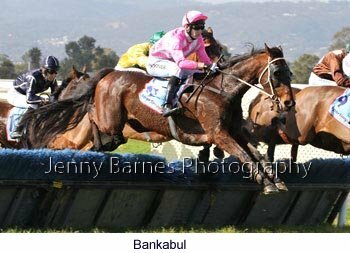 During that season he won the Lachal, Australian and Grand National Hurdle before going on to win the Hiskens Steeplechase and he later went to Japan for the Grand Jump but was injured while in Japan. 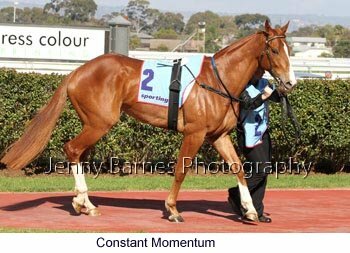 After that he was retired and went on to compete in all facets of equestrian including showjumping and hacking. So his namesake has a bit to live up to in the future. 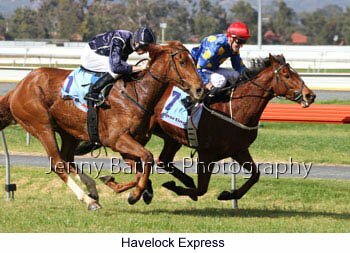 In the race Havelock Express jumped straight to the lead from Marlborough then Rich Hill on the rail followed by Frisky No More wider and Constant Momentum in the forward group. 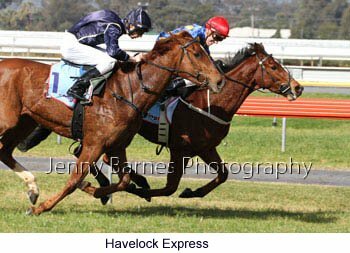 Around the turn Havelock Express went for home as Rich Hill moved out to chase hard from Marlborough with Frisky No More running on out wide. 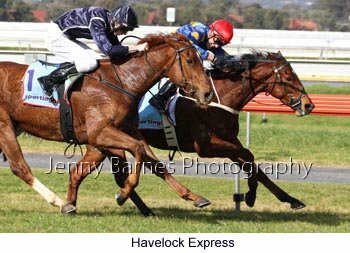 Rich Hill hit the front halfway down the straight and looked the winner but inside the final 50m Havelock Express raised another effort to fight his way back on the inside and win starting to draw away with Frisky No More running home well for third. 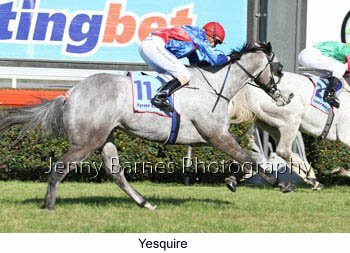 The next race over 2500m saw another full field of stayers and a handful of jumps horses having a flat run including Cash Advance who has been putting together a good record over the steeplchase fences in Victoria and Yesquire who has had his last two over hurdles locally. Doc Hennessy led once the field had settled into with Yesquire in third following Willego while Flaming Moe was just behind midfield on the rail. 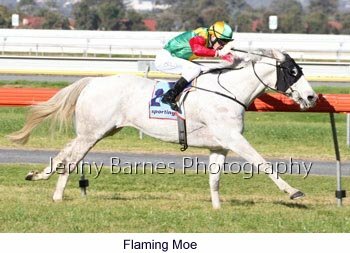 By the 800m Doc Hennessy led Willego with Yesquire up in third followed by Sky Pharoah with Flaming Moe making steady ground up to fifth. 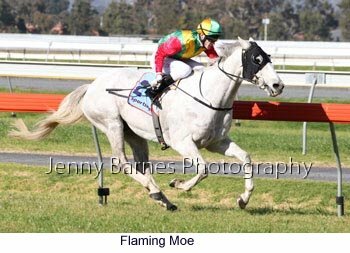 Turning for home Flaming Moe made his run to join the leaders in Willego and Doc Hennessy as Yesquire was caught up waiting for a run with a gap to the rest of the field. 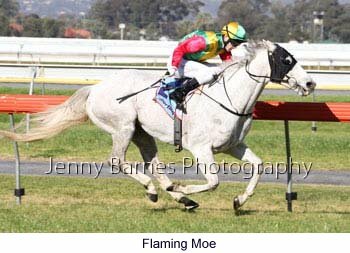 Inside the final 100m Flaming Moe had sprinted well clear with Yesquire trying hard to run him down while Rikbat starting making late ground but it was to no avail as Flaming Moe became the third Victorian winner of the day from Yesquire with Doc Hennessy holding third just ahead of Rikbat. 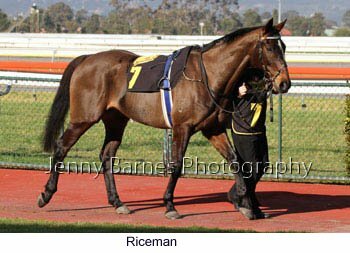 The Open Hcp over 1600m was next which saw grand old campaigners Road Worker, Woodland Jack and Riceman line up against the younger brigade. River's Lane and Vima led early from Alrouz then Roadworker outside Light Tan with Riceman further back. 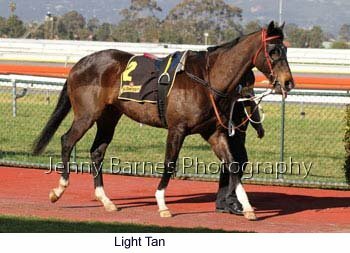 Around the turn River's lane was still in front from Vima but Light Tan had quickly moved up to third from Woodland Jack followed by Riceman. 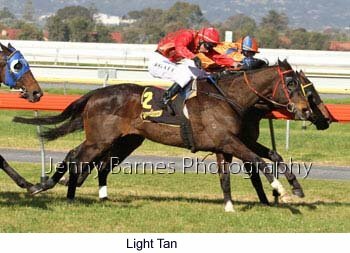 By the 200m Light Tan drew alongside River's Lane who fought back strongly as Woodland Jack ran one while Vima fought on between runners. 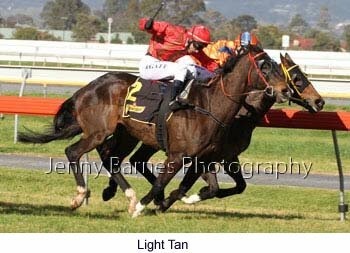 Light tan looked to get the upper hand with 50m to go but River's Lane fought back again and on the line the bob of the head decision went to Light Tan who lunged in time to win with Vima taking third from Woodland Jack in the closest finish of the day while Riceman ran on for 5th. 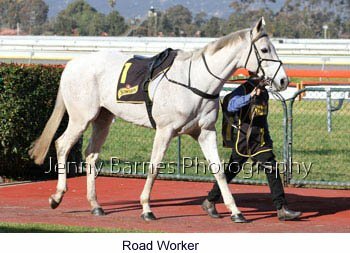 Roadworker finished well back and is to be retired after a career that started as an early season 2yo in 2004 going on to win at Flemington as a 3yo before running 4th in the Group 2 Qld Guineas. 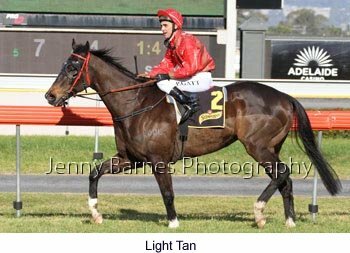 He later won the OJ Smith Challenge Stakes (Listed) and the Balaklava Cup (Listed) and raced in the Gr 1 Caulfield Stakes finishing only 6 lengths from the winner in a career of 63 starts for 10 wins and 22 placings. 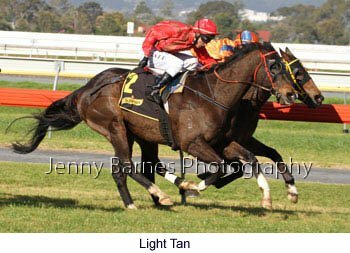 Snip N Run proved too good in the next just holding out a determined challenge from Emmooki's Dash with Tilla Bell Rings third while Last Charge defeated A Wee Dram with a gap back to Mr Good Cat third. 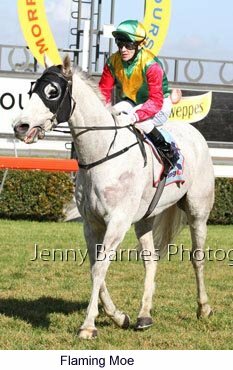 In the last race the lightly raced Belsynd won by a length from equal favourites King Buddy and Stratumsphere.